For fans of The Light Between Oceans, this “exquisitely written, true book of wonders” (Geraldine Brooks, Pulitzer Prize-winning author) explores the aftermath of World War II in an Australian seaside town, and the mysterious poem that changes the lives of those who encounter it. In 1948, in a town overlooking the vast, blue ocean, Anikka Lachlan has all she ever wanted—until a random act transforms her into another postwar widow, destined to raise her daughter on her own. Awash in grief, she looks for answers in the pages of her favorite books and tries to learn the most difficult lesson of all: how to go on living. A local poet, Roy McKinnon, experiences a different type of loss. How could his most powerful work come out of the brutal chaos of war, and why is he now struggling to regain his words and his purpose in peacetime? His childhood friend Dr. Frank Draper also seeks to reclaim his pre-war life but is haunted by his failure to help those who needed him most—the survivors of the Nazi concentration camps. Then one day, on the mantle of her sitting room, Ani finds a poem. She knows neither where it came from, nor who its author is. But she has her suspicions. An unexpected and poignant love triangle emerges, between Ani, the poem, and the poet—whoever he may be. 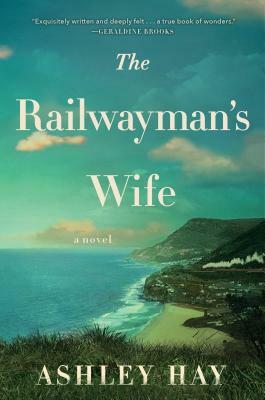 Written in clear, shining prose, The Railwayman’s Wife explores the power of beginnings and endings—and how difficult it can be to tell them apart. It is an exploration of life, loss, tragedy, and joy, of connection and separation, longing and acceptance, and an unadulterated celebration of love that “will have you feeling every emotion at once” (Bustle). Ashley Hay is the internationally acclaimed author of the novels A Hundred Small Lessons, The Body in the Clouds, and The Railwayman’s Wife, which was honored with the Colin Roderick Award by the Foundation for Australian Literary Studies and longlisted for the Miles Franklin Literary Award, the most prestigious literary prize in Australia, among numerous other accolades. She has also written four nonfiction books. She lives in Brisbane, Australia. “Hay handles the delicate progress of Ani's return to the world with sympathy and toughness; she is an author in whom intellectual scope and empathetic imagination are not separate activities but two sides of the same coin…. recalls the sour-sweet best of Michael Ondaatje's fiction. Another author, Ford Madox Ford, began his The Good Soldier by claiming, 'This is the saddest story.' It isn't. That title rightly belongs to The Railwayman's Wife." "Hay delicately threads together the lives of a widowed librarian, an unproductive poet, and a guilt-ridden doctor as they grapple with life after loss in post-World War II Thirroul, a small seaside village in New South Wales, Australia." "[Hay's] prose style is simple yet vivid, and her insights on bereavement and moving forward are wise. Perhaps most impressive is her portrayal of the human predicament, the notion that one's heartfelt hopes are sometimes crushed against the rocks of reality."